TURBO TURF UNITS OFFER THE EASIEST CLEAN UP OF ANY UNITS ON THE MARKET. GET DONE QUICK 4000 SQUARE FEET PER TANK!!! FAST SEEDING AT AN AFFORDABLE PRICE! Mechanical units have one or more rotating shafts with paddles inside the tank stir the material to blend the mix. These units work well and are good quality units. One disadvantage of a mechanically agitated system is that to rotate the paddles it requires a complicated drive system with hydraulic motors, chains sprockets and other parts. The metal tanks and added mechanism makes the units much heavier and usually requires a heavier tow vehicle. The second major problem is with the metal tank rusting. Turbo Turf mechanically agitated units have a poly tank that can never rust and is so reliable the tanks in those units now have a 20 year pro rated warranty. 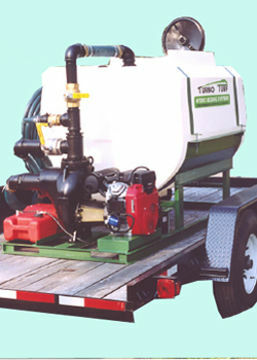 Turbo Turf's jet agitated hydro seeding systems offer fast even mixing with no moving parts inside the tank. Turbo Turf's agitation system has two large jets on the lower left side of the tank that are pointed up, and parallel to the outside surface of the tank. A very high volume of water and materials (up to 740 g.p.m.) shoot out of these jets creating an intense rolling action inside the tank. 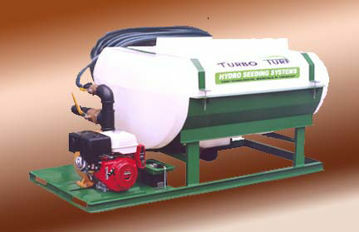 Turbo Turf's jet systems have a plastic tank that can never rust. A fast mixing action that will mix a full load of materials in minutes. A light transport weight that allows the use of a lighter towing vehicle. They offer wide open passages that virtually never plug. Turbo Turf systems have low maintenance cost and only 4 moving parts excluding the engine (an impeller that screws right on to the engine shaft, and 3 ball valves).